The fast-paced life of a food writer and professional cook. 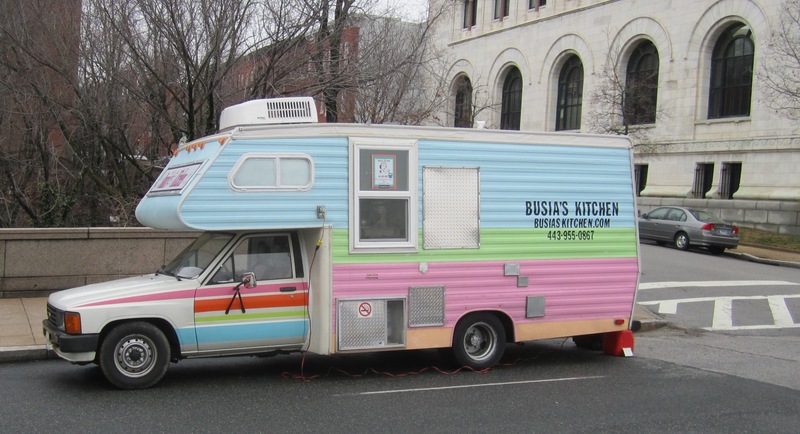 This week, my review of a food truck called Busia’s Kitchen is featured in the Baltimore City Paper. It’s always so cool to see your work in print. 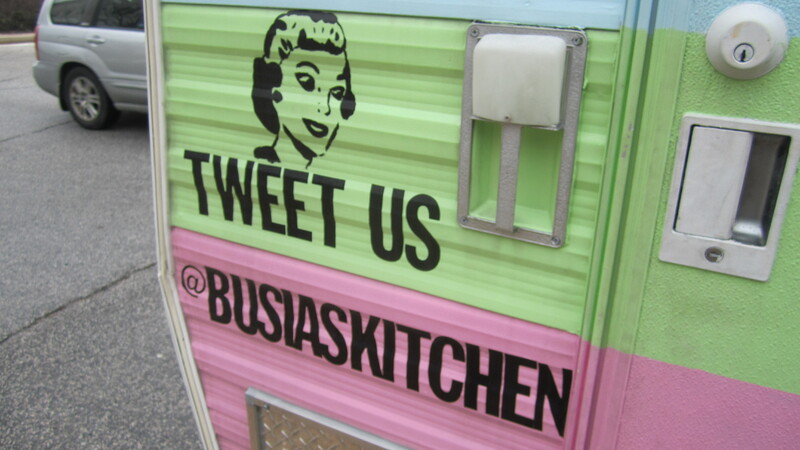 Check out it here: http://citypaper.com/eat/busia-8217-s-kitchen-1.1446637. The mother-daughter team that runs the truck prepares traditional Polish recipes that their own Busia (a Americanized Polish term of endearment for Grandma) used to make. 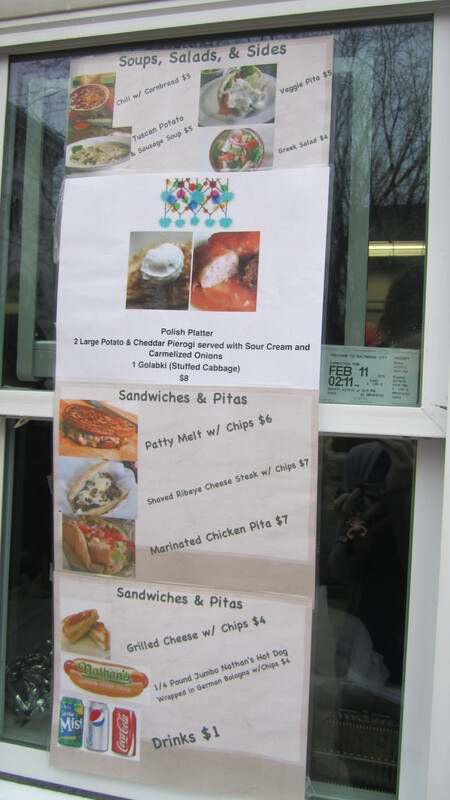 I feasted on pierogis (Polish dumplings), golabkis (stuffed cabbage) and more. Below are some photos from my experience that didn’t make it into the City Paper. 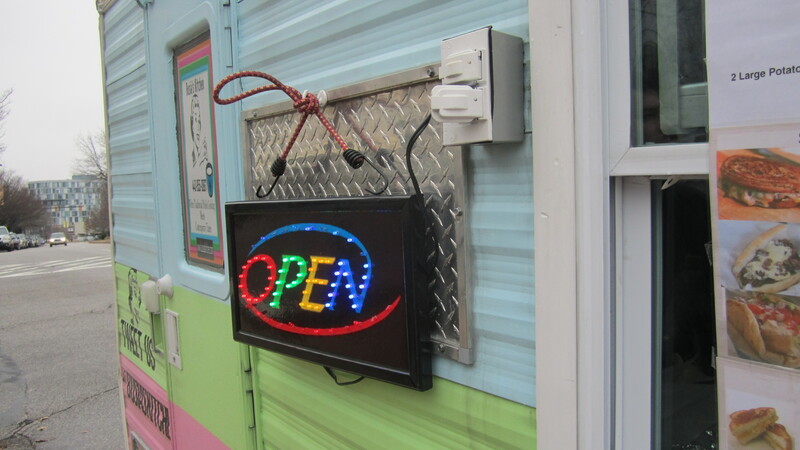 This food truck’s definitely got some personality! Busia’s Kitchen is open for business. Can’t find these prices in D.C.! Yesterday, I bought a pound of mussels at Giant for $5.99. Wow. That’s cheap, considering how much food costs these days. It’s more than enough to feed two people, too. The mild, buttery flavor of mussels makes them extremely versatile. They can be paired with a myriad of ingredients, many of which you probably already have in your kitchen. Canned tomatoes, fresh tomatoes, white wine, beer, chicken stock, lemon juice are just a few of the items you can use. It takes a little effort to clean mussels, but it’s really not that bad. Here’s how I do it: dump them into a colander/strainer and rinse thoroughly in cold water. Then, check each mussel carefully, discarding any with broken or open shells (they could be spoiled). This next step is important: make sure to remove any thread-like fibers, or the beard. The beard peeks out from the shell and is rough to the touch. In the wild, mussels use the beard to anchor themselves to rocks underwater, protecting themselves from crashing waves. That’s great, but you don’t want to eat that. Remove the beard by gripping the fibers with your fingers and pulling them until they release from the shell. Keep in mind, you may have to put some “mussel” into it (That was painfully punny wasn’t it?). Cooking mussels is almost fail proof. Covering the mussels with a lid creates steam inside the pan, helping them to cook. The shells will open and you should see the mussels detach themselves a little, but not completely. Lift up the lid while they’re cooking and take a peek. When cooked, the mussels should be firm, but still a little chewy. Try my recipe below. The spiciness of Old Bay combined with the acidity of tomatoes is a winner here. You’ve also got subtle sweet and bitter flavors contributed by the white wine and olive oil. I like to serve mine with crostini, or toasted, thinly sliced baguette. It’s a gourmet, simple meal that’s pretty easy on the wallet, too! 2. Peel and smash garlic cloves, using the flat side of your knife or the palm of your hand. 3. Core and chop tomatoes roughly. 4. Pick parsley leaves and chop or chiffonade (roll up a small pile and slice thinly with your knife). 1. Heat 1 tablespoon of olive oil in a large sauté pan. Add crushed garlic cloves and sauté over medium-high until browned. 2. Add chopped tomatoes, Old Bay and a pinch of salt and pepper. Toss to combine the ingredients. 3. Add the mussels and white wine. Cover with a good lid and let the mussels cook. 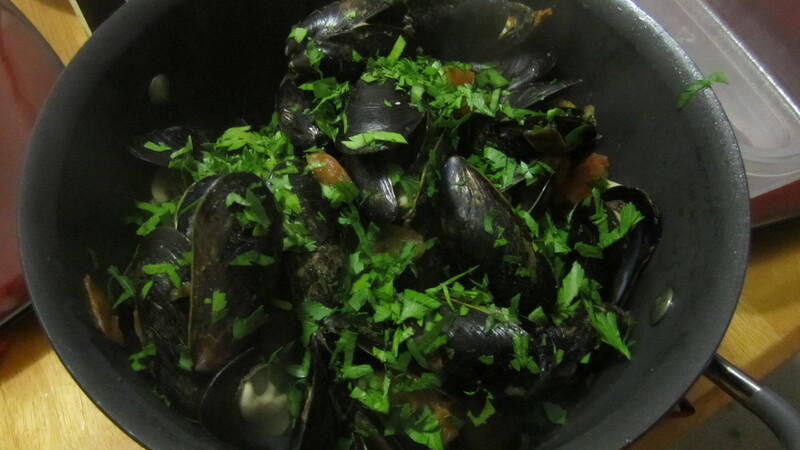 Pour the other tablespoon of olive oil over the mussels after about a minute and cover again. 4. Remove from heat when the shells open and the mussels have detached themselves a little from inside the shells. 5. Serve with crostini (thinly sliced baguette rubbed with olive oil, salt and pepper and toasted at 400 degrees until golden) and enjoy. Make sure to scoop up some of the broth, either with a spoon or piece of crostini! Every time I walk into a Whole Foods grocery store, I transform into a hyperactive eight year old during recess. I race up and down the aisles, imagining all the dishes I could possibly make. I love the fresh produce, the whole fish on ice and that magnificent salad bar. My excitement comes to an abrupt halt when I see Wild Alaskan King Salmon for $32. Ouch. Yes, I know. I really shouldn’t be shopping at a grocery store where toilet paper costs $5.00 a roll. But hey, we all have our weaknesses. On a recent trip to a Whole Foods in Friendship Heights, I discovered lamb shanks in the meat section. For about a pound, they were just under five dollars. Next to the shanks were lamb necks, which were only $2.50 for a pound. Lamb and cheap don’t belong in the same sentence, right? Unable to pass this deal up, I bought two shanks and four neck bones. What to do with six, relatively obscure cuts of meat? Because lamb shanks and neck bones are rather tough and fatty, they must be braised or stewed until the meat easily falls off the bone. Oh yes. More fat means more FLAVOR! I finally decided on my take on a popular Moroccan stew dish called tagine. Originating from North Africa, the meaning of the tagine varies by country. Moroccans prepare a tagine by braising tougher cuts of meat and vegetables in an aromatic sauce until tender. It is almost always served with couscous. The traditional cooking vessel, called a tagine pot, resembles a cone-shaped clay or ceramic cooking vessel that requires very little water to use. The tagine’s cone-shape locks moisture inside during cooking, ensuring a flavorful stew. In this recipe, I used an enameled cast iron Dutch oven. Like the tagine, the Dutch oven can maintain a gentle simmer at low, even heat for a long time, making it a great choice for stews, soups or braises. If using dried chickpeas, make sure to soak them in plenty of water the night before. Peel and slice carrots. I sliced them a medium thickness and on a bias, but feel free to do it however you prefer. Chop onion, medium dice (if it’s too small, the pieces will burn). Peel garlic and smash the clove using the flat side of your knife. 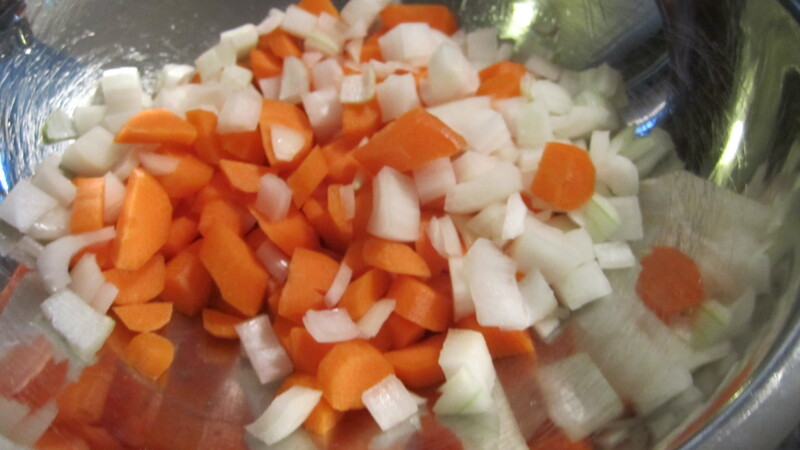 Combine carrots, onions and garlic in a bowl and set aside. Combine all spices in a bowl and set aside. Heat oil in a large pan. 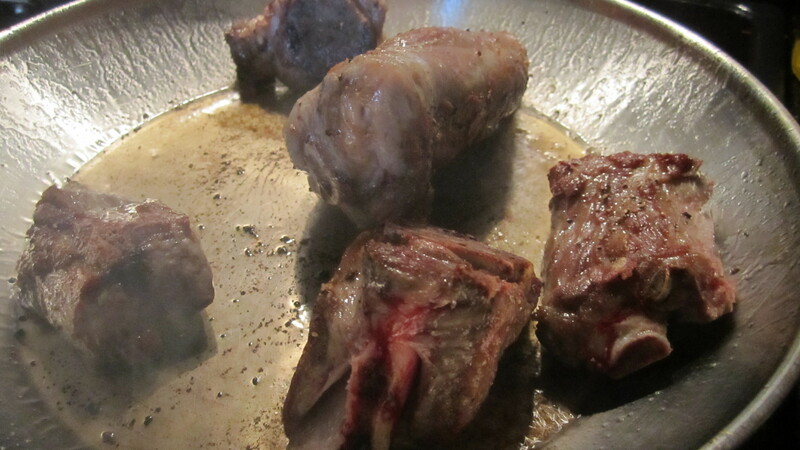 Season lamb neck bones and shank with salt and pepper. Over high heat, brown the meat. Remove the meat from the pan and place it in the Dutch oven. Pour out excess grease and add the carrots, onions and garlic. Season with salt and pepper, stirring or tossing to combine. Cook vegetables for 3-4 minutes and then pour over the browned meat in the Dutch oven. Add spices to meat and vegetables, stirring to make sure everything is coated evenly. Add chicken stock and the canned tomatoes and turn on heat to high. Bring to a boil and lower heat. While stew is heating up, use your spoon to mash up the whole tomatoes a bit. Cover and simmer over low heat for at least 2 hours. The meat should easily pull away from the bones when it is ready. Now there’s a healthy simmer! Add the chickpeas to the stew. If you are using dried chickpeas, continue to simmer for another 15-20 minutes to make sure they are cooked. They should be a little crunchy, but not hard. 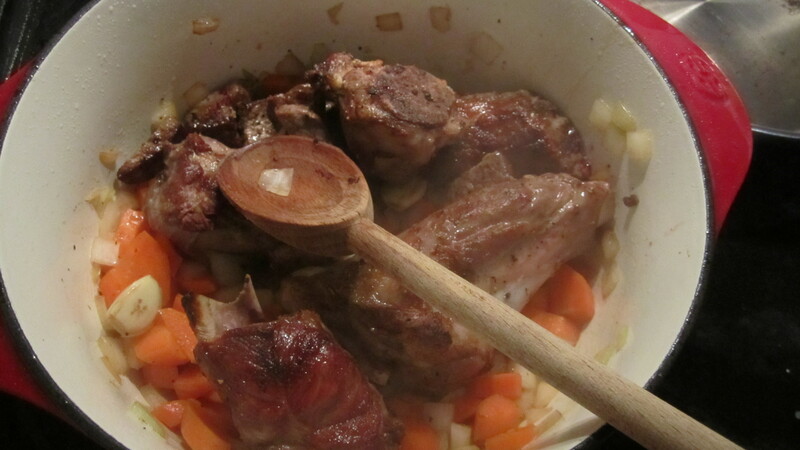 Using tongs, remove shanks and neck bones from stew onto a plate. Use a fork to gently pull the meat away from the bones (scrape any excess fat off of the meat). Add the meat back to the stew and stir to combine. Add golden raisins to stew. Season the stew with salt and pepper and add juice from 1 lemon. 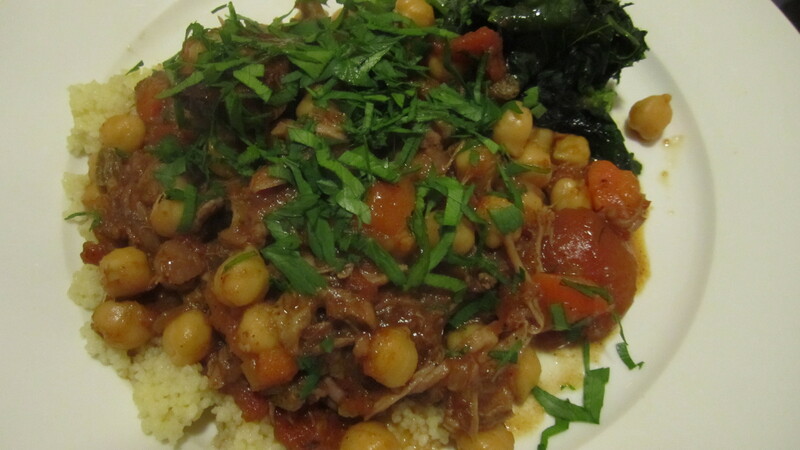 Garnish the stew with chopped parsley and serve over couscous. Enjoy! I loved the combination of spices in this stew. Because I haven’t worked with ground coriander very much in the past, I was excited to get to know it a little better in this recipe. Ground coriander’s subtle tones of citrus worked with the cayenne and crushed red pepper to brighten up the stew’s flavor. The sweetness of the golden raisins was a nice touch, too. 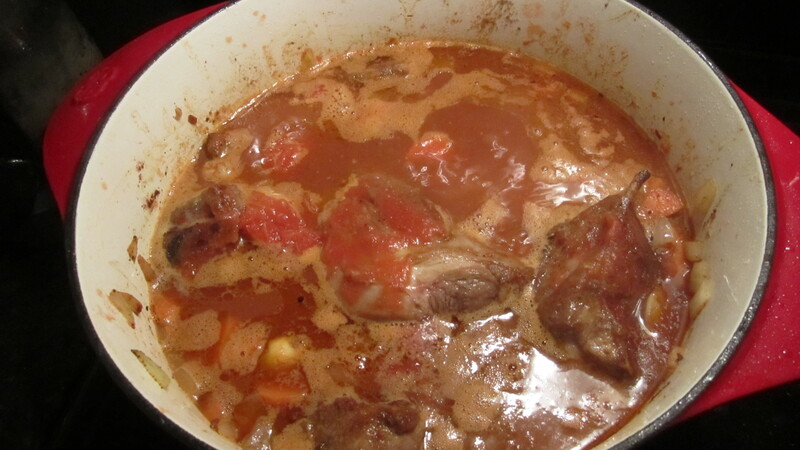 If I made this stew again, I might try a boneless lamb shoulder, cubed and trimmed of all of its fat. If you’d rather use a different budget-friendly protein, look into eye of round steak (it’s very lean) or chicken thighs (not quite as lean, but still cheap!). I think it’s safe to say that this brutally hot summer is finally over. About time, too – it’s nearly November! At the Dupont Circle farmers market yesterday, winter squash and root vegetables ran the show. My findings included spaghetti squash, kale, carrots, sweet potatoes and leeks. Today, I’m stuck inside my apartment because of Hurricane Sandy. It’s currently 52 degrees, cloudy and windy. It doesn’t seem too bad now, but the forecast says the worst is coming. Who knows if it actually will get worse, but during all of this Sandy insanity, I’m going to make soup. Farmers market sweet potato, carrot and leek soup. I left the basic ingredients of the soup, sweet potatoes and carrots, relatively untouched. A hint of ginger and cinnamon, and a touch of crushed red pepper contrast the sweetness of the soup. Chicken stock adds salt. Adding lemon juice at the end (I think cooking lemon juice weakens its flavor) adds a final element of acidity to the soup. My favorite part about this soup is the leeks. They lend a mild, earthy flavor that pairs perfectly with sweet potatoes and carrots in the soup. I don’t think the sharp flavor of onions would have worked nearly as well. In my opinion, leeks are not used enough in home cooking. They require a little more effort than onions, but the result is worth it. Leeks often have grit, so it’s important to rinse them with water beforehand. I always slice off the top, dark green part, as the flavor comes from the white part of the stem. You can separate the leek stem into segments, halve them, and then slice them thinly. Easy, right? Okay, enough about leeks. Let’s cook. Slice off the dark green part of the leeks, and dice the white and very light green parts. Rinse the diced leeks in water. Start in a pot with olive oil over low-medium heat. Add salt and pepper and stir until leeks have softened. Add sweet potatoes and carrots and stir to combine. 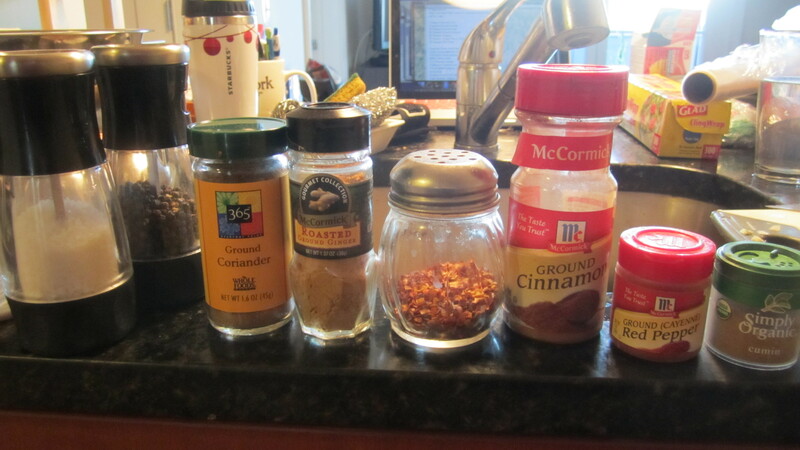 Add dried ginger, cinnamon (don’t go crazy on this one) and crushed red pepper. Add chicken stock, enough to cover the vegetables completely. Bring to a boil, then turn down heat to a simmer. When potatoes and carrots are tender, remove from heat and pour into a blender. Puree until smooth. Depending on the quality of your blender, this could either take a few minutes or a bit longer. The soup should have a smooth consistency without any chunks. If the soup is too thick, add stock to thin it out. Add lemon juice to pureed soup. Keep in mind that you might not need all of the lemon juice, so add it to taste. Double check for seasoning (does it need more salt? ), and enjoy.